The world of IT security is undergoing tremendous change. The unstoppable momentum of the Internet and cloud computing, the ubiquity of mobile devices and the emergence of Internet of things have together turned the IT security landscape upside down. Data security, privacy and compliance have never been more at risk than in today’s social and mobile world. Why should your organization’s security move to the cloud? 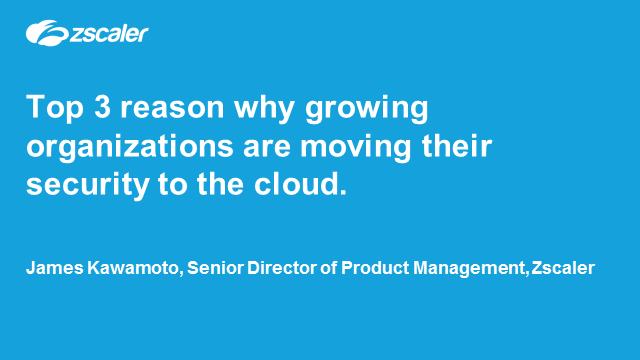 Join James Kawamoto, the Senior Director of Product Management, Zscaler Inc., for a compelling webcast that will highlight key reasons why growing organizations are moving their security to the cloud. Presented by: James Kawamoto, Zscaler Inc.